Wapakoneta, at the hub of West Central Ohio, is centrally located between Chicago, Cleveland, and Cincinnati. More than 9 million people live within 300 miles of the city. It is within a day’s drive of more than 50 percent of the U.S. and Canadian population and 70 percent of the manufacturing facilities in North America. This easy access to profitable markets allows Wapakoneta’s companies to reduce their cost of doing business. It provides an ideal location to reach U.S. customers and to export to Canada, Mexico and the rest of the world. 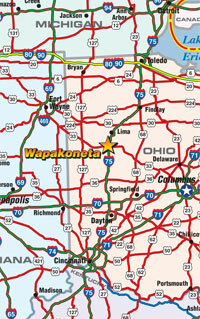 Wapakoneta is at the intersection of two major U.S. highways – Interstate 75 and U.S. 33. More than 20 million people pass through Wapakoneta each year on I-75. At the center of the 12-county west central Ohio region, the city is a natural for retail and service sector success. More than 650,000 people live within the region and I-75 and U.S. 33 puts Wapakoneta at the heart of that market. Shoppers within the region have quick and convenient access to the city’s stores, restaurants and service providers. 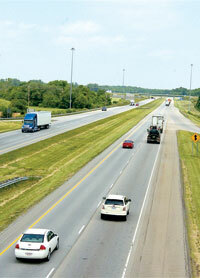 An estimated 5.4 million commercial vehicles travel through Wapakoneta annually on I-75 and nearly a million on U.S. 33. These statistics indicate the city’s connectivity with commercial freight traffic throughout North America. The city also has a significant rail advantage with its CSX mainline rail service. CSX operates the largest railroad system in the eastern U.S. with a 21,000-mile rail network linking commercial markets in 23 states. Two of Ohio’s five international airports are within 90 minutes of Wapakoneta. Dayton International is 60 miles south on I-75 and Port Columbus is 90 miles east on U.S. 33. Both are within 90-minute air flights of 55 percent of the U.S. population via more than a dozen air lines. Just minutes from Wapakoneta, Auglaize County’s Neil Armstrong Airport, AXV, is one of Ohio’s best general aviation airports. With all-weather landing facilities and a 5,500-foot runway, it handles a high volume of air freight and corporate/private travelers with an average 40 flights daily. With these location and transportation advantages it is easy to understand why Wapakoneta continues to be a place to succeed.